We have talked a lot on this site about magnetism and how it affects a watch (and the measures to block this, usually in "milgauss" model watches). I am happy to introduce the Witschi Teslascope to WatchProSite readers. 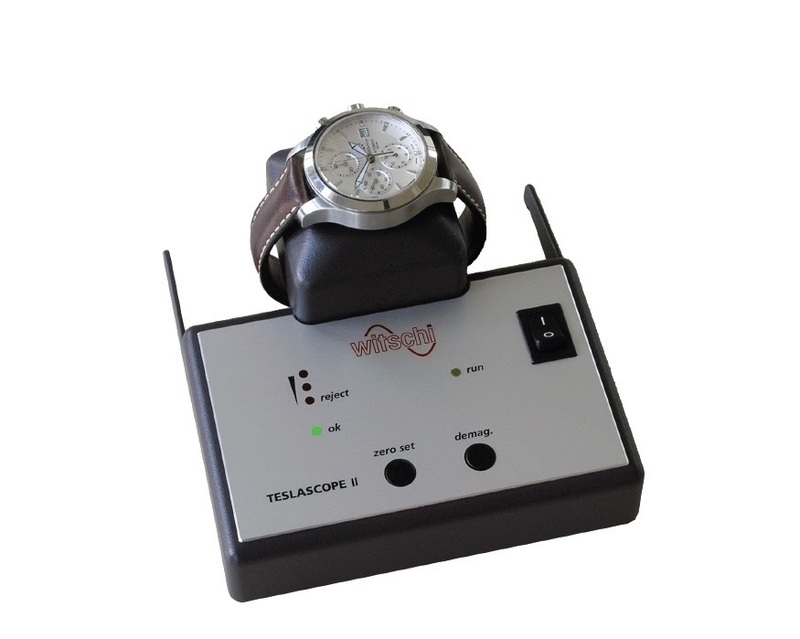 This is a device which measures the degree of magnetism which is encompassing your watch (using 4 LEDs) and then provides a means to demagnetize the watch. It costs about $1000. 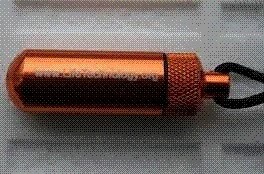 Witschi makes another device called the teslascan, which enables you to obtain a visual representation of the magnetism inhabiting your watch's movement. You simply place the movement on the glass and connect a display panel. The item is scanned with a magnetic field sensor in two dimensions with a maximal resolution of 0.5 mm. The magnetism present is accurately displayed using a three-dimensional image, with colour coding of the magnetic flux density. 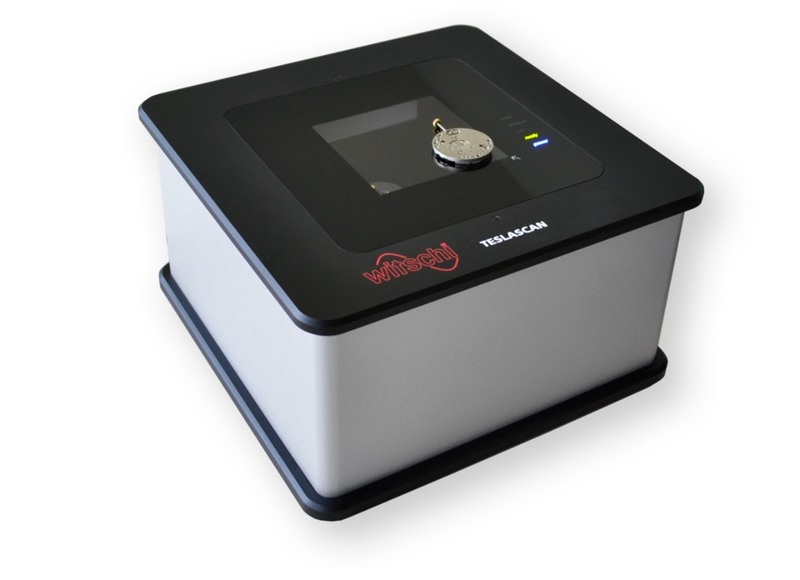 Including PC software and internal digital camera which captures the magnetic array imagery, the Witschi teslascan costs CHF 38,500. What does Tesla have to do with these devices? Why is it called the Teslascope or Teslascan? I guess it's because he "invented / discovered / refined" many concepts of magnetism, attraction and repulsion. Nikola Tesla is alleged to have invented a device 100 years ago ... the original TESLASCOPE, for communication with other planetary species. See article below (italics added by me) but use your own discretion in evaluating its comments! The Hyperdimensional Oscillator™ is based on the famed Teslascope ,the device that Nikola Tesla invented to communicate with other planets. In effect it is a transducer, capable of converting the high frequency of cosmic rays to an energy field which can interface with the human mind. We can use these energies for healing the human body, or simply allow them to guide and instruct us as Tesla did. The possibilities of The Hyperdimensional Oscillator™ are indeed limitless and our research has merely scratched the surface of this incredible technology. Like Tesla himself, we have been guided in our research by higher forces and channelled information which has enabled us to build the Teslascope in miniature using 21st century electronic componentry. In today's world of specialization it is hard to imagine that one man invented Alternating Current, the Radio, X-Ray photography, the basics of lasers, computers, robotics, remote control systems, ball lightning, fluorescent lights, broadcast energy, force-fields, earthquake generators, anti-war machines, UFO's, and a communication device to contact other planets. The giant Westinghouse Electric Company was founded around just a few of his patents. Nikola Tesla is single-handedly the Father of the modern Electrical Utilities, Electronics, Communications, and Computer Industries. In addition, he was offered a royalty of $2 for every horsepower generated by the use of Alternating Current, which would have made him the Richest Man in the World, a billion times over! In his day he was called "The Greatest Inventor Who Ever Lived" and "The Man Who Invented the 20th Century"! In addition to a bitter battle with his inventor rival Thomas Alva Edison who helped Count Guglielmo Marconi allegedly steal Tesla's invention of the Radio, Tesla fought a losing battle with J.P. Morgan and his group for the Energy Control of the entire planet. Tesla was virtually written out of history by the wealthy Energy Cartel, and later by the United States Government; who had him working on Top Secret Projects like the so-called "Philadelphia Experiment". This combined Tesla's technology with Einstein's still-secret discoveries in physics causing a US Navy Destroyer called the Eldridge to disappear in 1943 into a parallel Universe with 493 men aboard. But the strangest twist in Tesla's amazing history is the most bizarre Alien Contact story of all time. In 1898 while Tesla was doing research at his special laboratory funded by J.P. Morgan built at Colorado Springs, Colorado; he began receiving signals from other worlds. Back at the famous Waldorf Astoria Hotel in New York in 1900, Tesla held a press conference that shook the world when he announced his discovery of those intelligent alien signals. If you've ever wondered why NASA built all those radio telescopes and then closed SETI, now you know. In 1937 a reporter interviewed Tesla on his birthday. He apologetically told the reporter that he had been so busy that he didn't get around to actually building his Teslascope communication device until 1917. But like all his 4,000+ other inventions, it worked perfectly, first try. Since then he had been in touch with other worlds at least 2 hours a day for over 20 years! The story was actually published in the newspapers in 1937, and no one seems to have picked up on it's significance. This was not just some lunatic or wino, this was the man regarded as the top scientist in the world in his day; a man who helped Einstein with his math! Life Technology Research International® have been granted access to documents and papers pertaining to the patent for Tesla’s original Teslascope and with the aid of our consultant electronics engineers we have been successful in creating The Hyperdimensional Oscillator™, a microcircuit which will duplicate the effects of the original device. The circuit is so advanced that it is actually a superconductor powered by scalar energies, the biophoton energy of the cosmos. The microcircuit is enclosed in a sturdy yet elegant metal container which is designed to be worn on the body as a pendant. The Hyperdimensional Oscillator™ is a tool of healing and enlightenment. It has been gifted to mankind at this time to enable us to awaken and receive the transformational energies of the cosmos. The Hyperdimensional Oscillator™ only allows subtle energy movement in one direction, which is positive and gives a positive spin of energy. The Hyperdimensional Oscillator™ also acts as a rectifier by keeping the body’s subtle energy field in perfect balance. The Hyperdimensional Oscillator™ corrects and filters the cosmic energies flowing into the human body to bring increased harmony and balance to the body’s electrical system. The Hyperdimensional Oscillator™ is specially prepared to emit cosmic resonant energy frequencies that synchronize and promote a healthy human bioenergy field. The Hyperdimensional Oscillator™ facilitates communication with higher dimensions including entities commonly termed ‘Extraterrestials’ or ‘ETs’. The Hyperdimensional Oscillator™ encourages & speeds up development of naturally present, but usually latent, psychic awareness leading to a greater feeling of connectedness and enhanced intuitive perception. 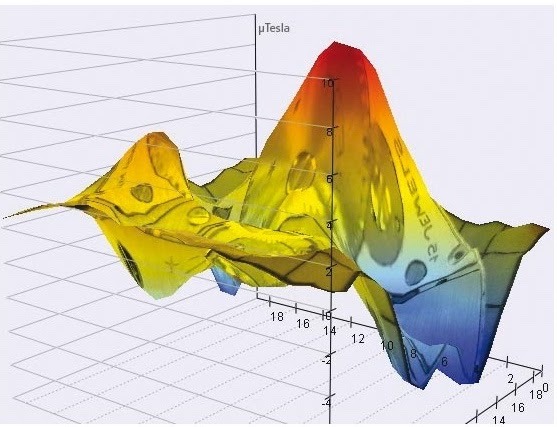 The Hyperdimensional Oscillator™ energy frequencies are picked up by the body’s electrical system; stabilizing, balancing and energizing the human bioenergy field. The Hyperdimensional Oscillator™ also helps to counteract the effects of harmful and stray electromagnetic fields (EMF’s) to which we are exposed everyday. You can still buy it for only $99.95! `awareness leading to a greater feeling of connectedness and enhanced intuitive perception` Exactly what this forum is about ! Great read, thanks ! ...their influence on our well being - Music, Voice, meditation can have moving effects on our moods and health . While some affect us positively, others not so - music can make you sad or fill you with energy and euphoria.